As a student, I’ve heard and read many different accounts of the civil rights movement, but listening to an oral history interview seemed more personal and intimate. I could see how emotional Jennie and Alice Wilson became when they told their stories and somehow, the struggles that African-Americans endured during the days of extreme racism and segregation became more of a reality to me. I doubt the effect would be quite the same if I were reading a book or watching a fictional account in a movie. The fact that these women came from Kentucky also made the interviews more poignant. As an African-American with very protective parents, I was very much shielded from racism and thankfully never had any overt racist encounters growing up, but it is interesting to learn Kentucky’s history of racial relations and see how things have changed since then. I felt like I could relate the most to Alice because of her personal struggles when she went to high school. She and her small group of friends were the only African-Americans at her school, making it difficult for them not to feel out of place. I didn’t always think about this, but there were moments when I would count the number of African-Americans in my classes. Often times, I would either be the only one or there would be a small handful of us. The 1896 Plessy v. Ferguson case upheld the “separate but equal” doctrine, which was the main focus of the civil rights era. Schools and other public places were segregated, allowing overt racist encounters to become a common occurrence. 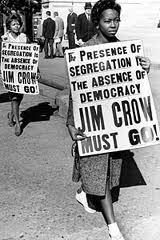 Jim Crow laws also legitimized segregation as a normality in American society. There were separate schools for whites and African-Americans, but by no means were these different groups getting the same education. My high school wasn’t exactly predominately white, but there was an overwhelming number of African-Americans in the lower Comprehensive classes compared to higher Advanced classes, which I took. Interestingly, the Honors classes—which were one level below Advanced and one level above Comprehensive—were much more diverse, but for some reason, the number of minorities dwindled when it came to Advanced classes. I had a diverse group of friends anyway and no one was racist at my school as far as I could tell, but I couldn’t help but wonder if there was a way to fix this sort of separation. I think this stigma further perpetuates the idea that African-Americans are sometimes seen as inferior to other races. This hits home for me because I feel like I am constantly trying to surpass the expectations society has for us. Even though racism is not quite as huge an issue as it used to be, the stereotypes still exist in hidden forms. I can’t help but ask: Is there a way to expose the inequalities that underlie our institutions? And if so, how do we get rid of them? “KET | Living the Story | Jennie Hopkins Wilson.” Living the Story: The Rest of the Story. Web. 28 January 2013.